Psychologically abused and forced by him to brand his name into her skin, Joy Delamere escapes to the streets of Seattle where she prays he can never find her. To many, this action seems drastic, but Joy knows that Asher, her abuser, has the power to cause her father to lose his job, their home, etc. There are few benefits to life on street, but Joy believes they outweigh the risks. On the streets, Joy is not being watched over by her overprotective family who coddle her because of her severe asthma. Joy also is able to meet Creed, a talented street musician. Creed allows Joy to join his family of street teens and Joy renames herself Triste. Creed’s family is made up of Santos and May. Though Joy enjoys her new life with Creed, May, and Santos, her medical issues always weigh on her mind and she faces the constant fear of being found by the police and returned to her family. This book offers an interesting look into the life some people face. Living on the street seems impossible to most of us. Joy shows us what living as a homeless person could be like. She also teaches the reader about inner strength, courage, and the importance of trust. Creed, Joy’s love interest, tries to watch over his street family and keep them safe from predators. Santos helps Joy adjust to street life and teaches her to survive while keeping her laughing with his humor. May, though ornery, is willing to sacrifice everything to protect her street family and saves Joy more than once. 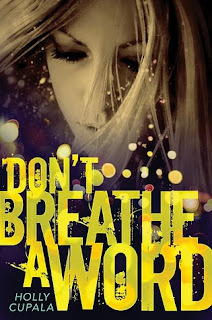 Don’t Breathe a Word should be read by teenagers. The content is harsh and could scare younger readers. Cupala’s style has subtext, there is hidden meaning in her writing. The subtext adds to the novel and the enjoyment of the reader. Don’t Breathe a Word is a great read and will make you appreciate your life. Holly Cupala’s novel is wonderful.